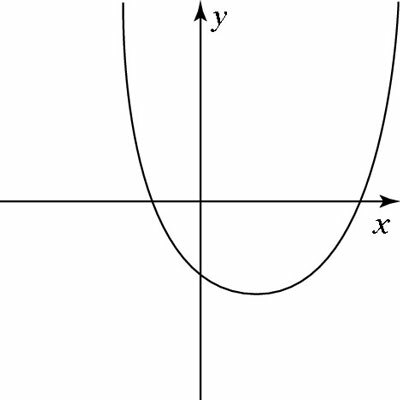 To save time when graphing a quadratic function on the ACT Math test, you can quickly determine the direction of the parabola using a simple trick based on the coefficient a. When a is positive, the graph is concave up. In other words, you can imagine pouring water in it like a cup. When a is negative, the graph is concave down. In this case, the cup is upside-down. This trick is especially helpful when a question gives you the graph of a parabola, because it’s easy to see at a glance which direction it’s facing. For example, which of the following equations CANNOT be the graph of the above function? 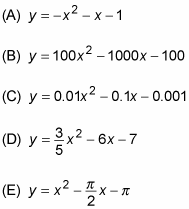 Even with a graphing calculator, graphing all five of these equations would take a long time. Fortunately, there is a much easier way to answer the question: The parabola in the figure is concave up, so a is positive. Voila! So the equation for this graph isn’t y = –x2 – x – 1, making the correct answer Choice (A).